Chhat Ib, a former Khmer Rouge soldier, lives in Anlong Veng, the last Khmer Rouge stronghold in Oddor Meanchey province near the northwestern border with Thailand. After the collapse of the Khmer Rouge in 1979 after the Vietnam-led invasion following Prime Minister Hun Sen’s defection to Vietnam in 1977, Ib remained loyal to the Khmer Rouge leaders, fleeing to the border where he hid in the mountains and kept fighting against Hun Sen’s forces. The 63-year-old former Khmer Rouge fighter said he was injured on his right hip by an explosion, but survived the war. “I was lucky that I still survived from the regime,” he said in a recent interview at his home in Anlong Veng. “I told my children that my life was full of fighting and being a soldier,” he added. He first fought against the U.S.-backed Lon Nol regime, to bring the late King Norodom Sihanouk back to power, but the regime that sprung up from this conflict was more brutal than he could have imagined. 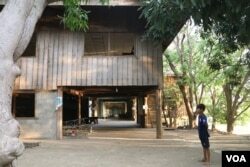 His neighbors are also mostly former Khmer Rouge, he added. Anlong Veng contains numerous physical reminders of Cambodia’s horrific past. Most of the Khmer Rouge who live here depend on farming rice and other crops. Another former Khmer Rouge fighter, Chhim Baing, said he also followed the Khmer Rouge after their defeat in 1979. “I still served them after 1975 because I didn’t know what to do, so I just followed them,” he said. Despite the majority of people in the area being former Khmer Rouge, there are some newcomers who came to do business in Anlong Veng, including restaurants, grocery stores, and entertainment venues. Like the rest of contemporary Cambodia, Anlong Veng has embraced capitalism and karaoke bars. Youk Chhang, director of the Documentation Center of Cambodia, or DC-Cam, said 85 percent of the population here are former Khmer Rouge. “In their mindset, they were the war’s losers. It was not a peace that came from reconciliation,” he said. “But we want them to know that there are higher-ranking officials responsible, including Nuon Chea and Khieu Samphan,” he said. The area is also steeped in the history of the conflict, with the grave of Pol Pot and the home of his military commander, Ta Mok, close by. Countless other reminders of the regime that oversaw the deaths of more than 1.7 million Cambodians are scattered around the countryside. Prime Minister Hun Sen, who was himself a former Khmer Rouge soldier, on Monday led the 40th anniversary of the regime’s downfall in Phnom Penh with thousands of survivors. There were dancers and performers with banners to mark the event. In the speech, Hun Sen, who took power under a government installed by Vietnam, praised his role in bringing “peace and stability” to Cambodia. 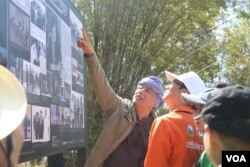 “Starting from zero, Cambodia has been on the way full of countless obstacles,” he said. Hun Sen in the past denied that he was a Khmer Rouge soldier since he claimed he did not know it was the Khmer Rouge that he joined. “I don’t accept that [I was a former Khmer Rouge soldier], since in the past I hated the Khmer Rouge the most, but I joined because I followed the call from late King Sihanouk,” he told American filmmaker Robert H. Lieberman in an interview for the 2016 documentary “Angkor Awakens”. 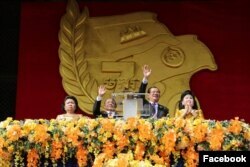 “King Sihanouk was not Khmer Rouge,” he added. Some former Khmer Rouge are still afraid of the Khmer Rouge tribunal, according to Chhang of DC-Cam. “They are still scared since Im Chaem, who lives here, was charged and investigated by the court, but it is lesson that the one who made a mistake has to be responsible,” he added. Chaem, a local regime official accused of mass murder and enslavement among other crimes, has enjoyed a peaceful retirement on her farm in Anlong Veng since the charges against her were dropped last year. She recently converted to Christianity. However, former Khmer Rouge soldier Ib said he still wanted the leaders to be held accountable.